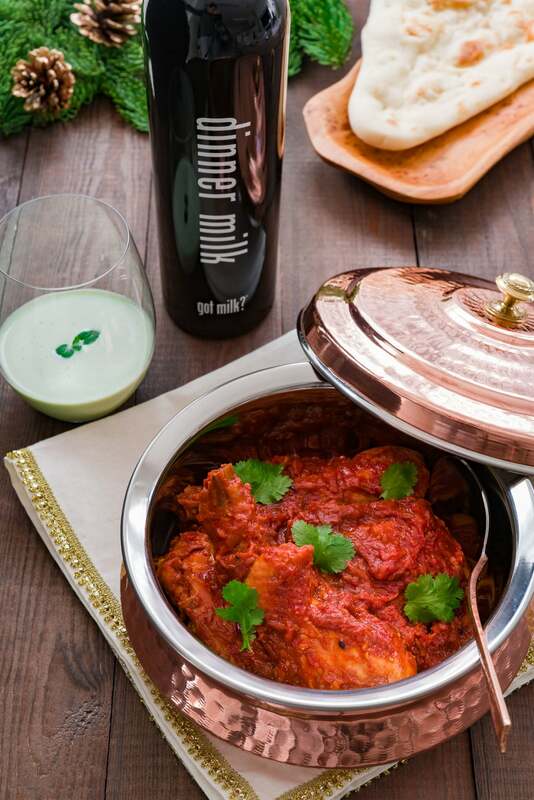 A fiery chicken and caramelized onion curry with cucumber and mint infused milk to tame the spicy curry. This week I want to talk about things that go together. When comparing things that make a good pairing you often hear the phrase: “they go together like cookies and milk”. While the pair do get along famously, I think it does a disservice to milk to pigeonhole it as a beverage to pair with sweet things. Although I didn’t think much of it at the time, when I was growing up, my family was a bit of an oddball. Although my mom ran a national retail business, she always made the time to make a home cooked meal from scratch, and we sat down as a family 7 days a week to eat dinner. Although the meals ran the gamut from Tex-Mex to Japanese to Italian, our choice of beverages was milk, Milk, or MILK. When I was asked by got milk? to pair something unexpected with milk, my thoughts ran immediately back to my childhood and all the savory meals I enjoyed with a cold glass of milk. Perhaps my most memorable milk experiences were when it helped save my tongue from from the burning heat of chilies. That’s why I decided to pair the milk with something spicy and savory. Loaded with chilies, this is a dry curry and the “sauce” consists mostly of caramelized onions and a bit a tomato. 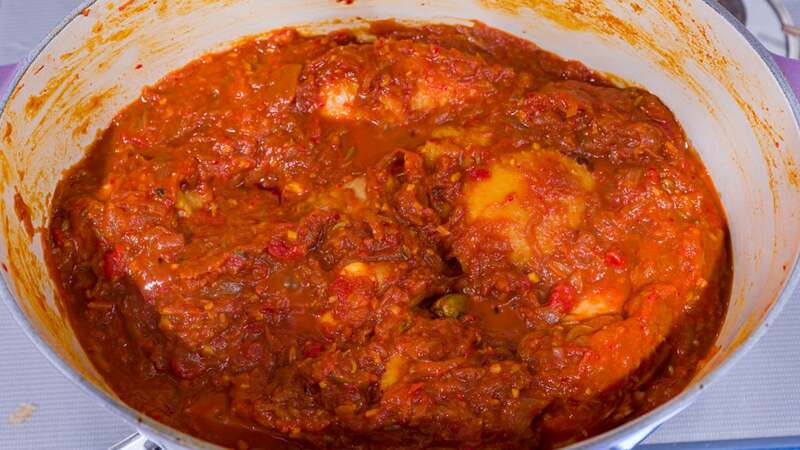 The sweetness from the tomatoes and onions are balanced by the savory chicken and potent heat from the chilies. First the chicken is marinated in powdered chilies, turmeric and lemon juice. 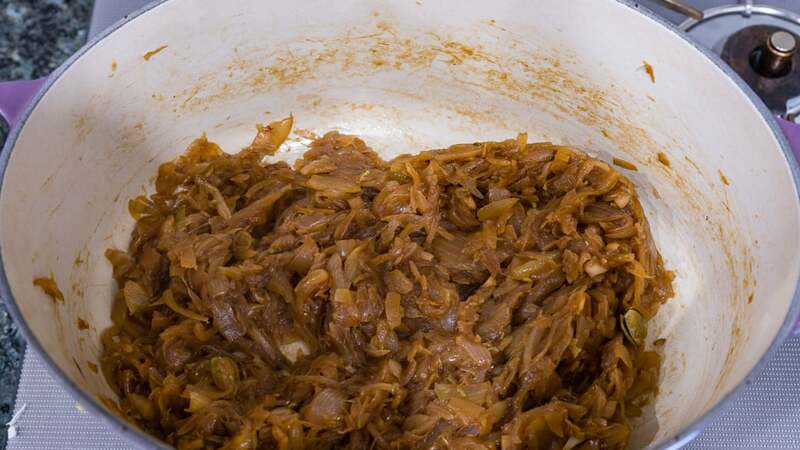 The key to making this is to fully caramelize the onions, ginger and garlic. This will take time and a lot of stirring to prevent burning, but it will be well worth your effort. 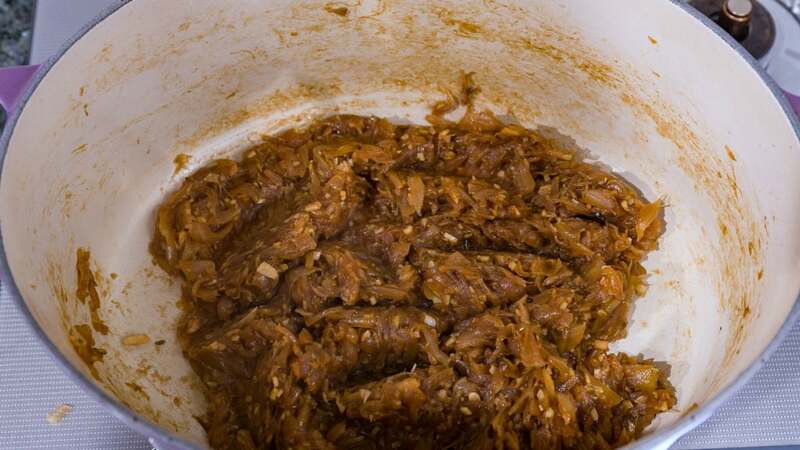 Check out my post on Perfect Caramelized Onions for a more detailed look at how to get your onions fully caramelized. Combined with some more spices and tomatoes, this mixture becomes the sauce, giving each bite an incredibly complex array of flavors with a robust umami that will have you smacking our lips in contentment. For the powdered chilies I used Korean gochugaru for their mild heat, bright color and sweet taste, but if you want it spicier you can use kashmiri chilies, aleppo chilies, or really whatever you have on hand. To tame the fire, a glass of cucumber and mint infused milk is the perfect pairing which abates the heat from the chilies. You see, chilies contain an oil called capsaicin that’s responsible for triggering the burning sensation when you eat a chili pepper. Milk contains a fat loving protein called casein that binds with capsaicin, allowing it to be washed away. 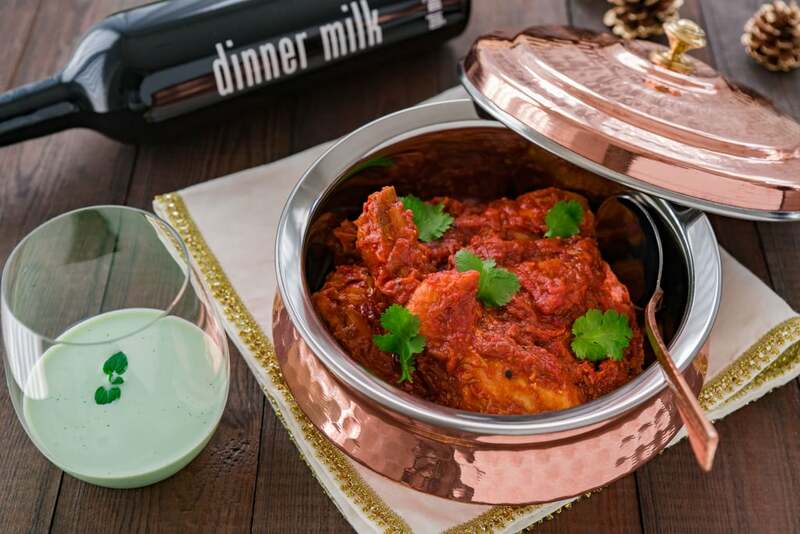 Aside from giving your milk a festive mint-green color, the cucumbers and mint give the milk a refreshing herbal flavor that’s the perfect compliment to the rich, spicy curry! 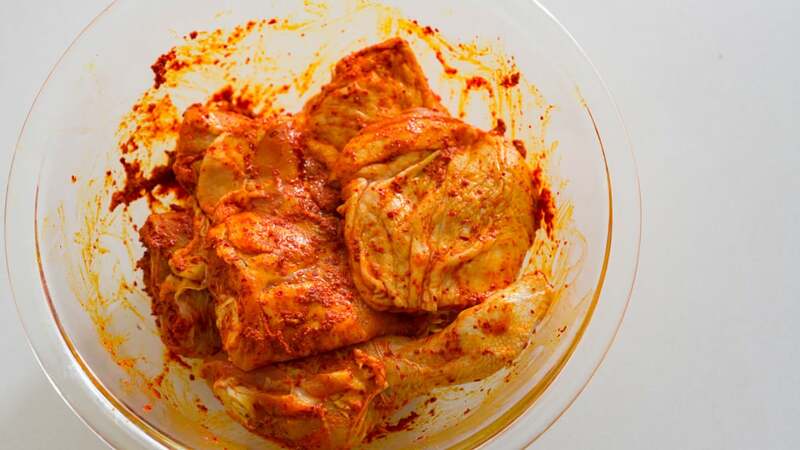 In a bowl, combine 1 tablespoon powdered chili peppers, turmeric, salt, lemon juice and vegetable oil to make a paste. Rub this all over the chicken and let this marinate for at least 30 minutes. Add 2 tablespoons of vegetable oil to a heavy bottomed pot such as a dutch oven and fry the fennel seeds and cardamom until fragrant. Add the onions and stir to coat evenly with oil. 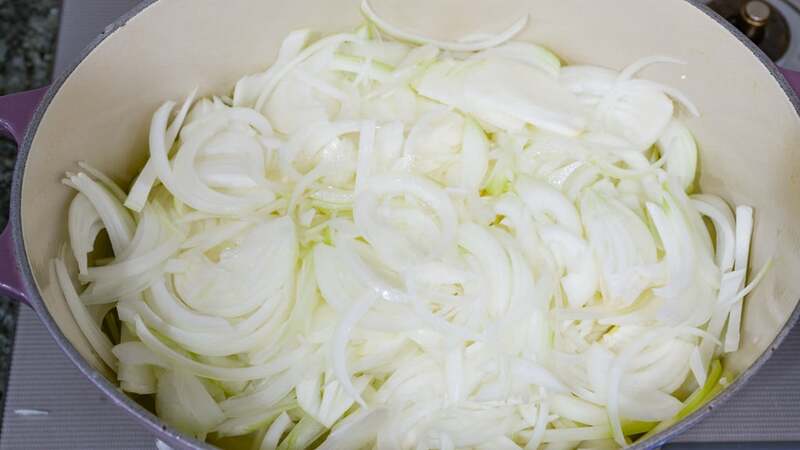 Turn down the heat, cover with a lid, and let the the onions steam for 10-15 minutes or until tender. Remove the lid and turn up the heat to medium and saute stirring frequently until the onions are about 1/3 the volume and starting to caramelize. Add the garlic and ginger and continue sauteing until the onions are fully caramelized. Preheat the oven to 350 degrees F (180 C). Add the canned tomatoes, 1 tablespoon powdered chili peppers, coriander powder, garam masala and salt and stir to combine. 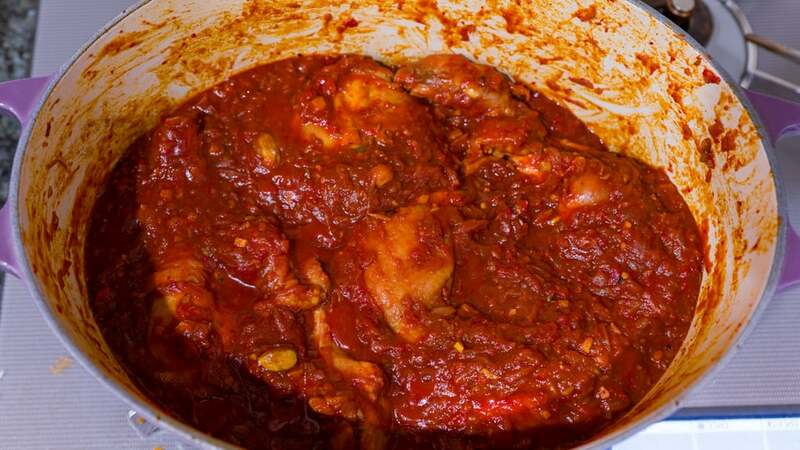 Add the marinated chicken along with any remaining marinade into the sauce and submerge. Put the pot in the oven uncovered until the chicken is cooked through and tender (about 35-40 minutes). Stir the chicken once in the middle to prevent burning. 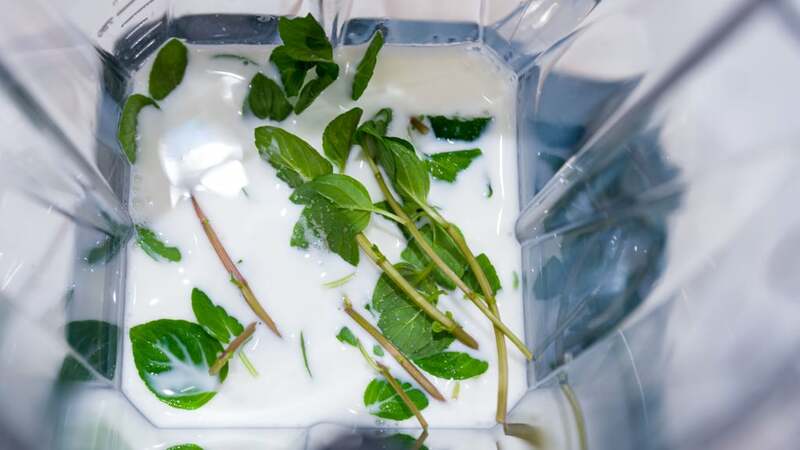 To make the cucumber mint milk, put the milk, cucumbers, mint, and salt in a blender and blend until smooth. Strain the milk through a fine-mesh sieve such a tea strainer to remove any pulp. Chill the milk until you are ready to serve. 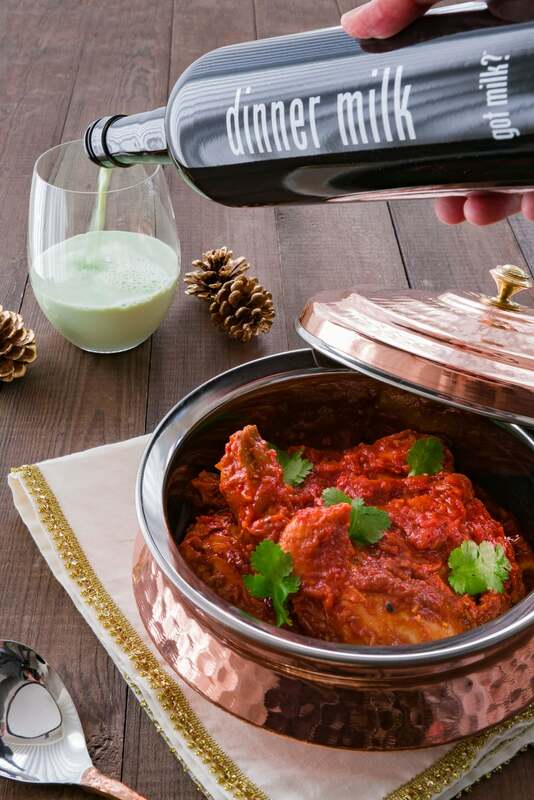 Garnish the chicken with cilantro and serve with the cucumber mint milk. P.S. This post was sponsored by our friends at got milk?, but as always, the opinions expressed are my own. Thanks Terry! It’s one of my new favorite curries, particularly with the weather the way it’s been lately.